Read the definitive workplace investigations book! Worklogic’s Workplace Investigations book is the definitive guide to conducting effective workplace investigations for Australian HR professionals. Workplace Investigations shows you, step-by-step, how to conduct a sound, procedurally fair and defensible workplace investigation. Worklogic is thrilled to announce that the second edition of Workplace Investigations published by Wolters Kluwer is now available for $90 (incl GST). We have negotiated a 20% discount on the second edition of Workplace Investigations (plus all Wolters Kluwer Employment, Work Health and Safety and Leadership titles) for Worklogic customers and friends. Simply enter the promo code WORK20 when ordering online. 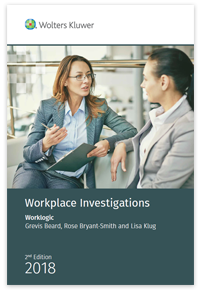 Written by Worklogic Co-founders, Grevis Beard and Rose Bryant-Smith, and Worklogic Senior Investigator, Lisa Klug, who have collectively conducted more than 300 investigations, Workplace Investigations is essential reading for anyone with responsibility for investigating workplace conflicts or complaints. More than 2,000 copies sit on the shelves of HR, risk and compliance managers and others who conduct in-house workplace investigations, around Australia. It is also prescribed reading for the Monash University Masters of Law course. assess any wrongdoing against your organisation’s policies and procedures, in cases of bullying, harassment, discrimination, fraud, theft and other breaches of policy. determine whether your organisation should take any further steps to improve working relationships or to manage risks. The second edition is fully updated and includes checklists, case law examples and practical tools, plus new information on managing digital evidence and fraud. Workplace Investigations also explores the key elements of procedural fairness, managing the emotional impact of the investigation, ‘high conflict personalities’ and how the organisation can use the lessons learned from the investigation to manage risks and to improve the workplace culture. Worklogic publishes regular updates on recent developments, case examples, new resources and practical tips on how to run investigations in our e-newsletter and blog posts.